The Democratic Party, soliciting for donations to celebrate Vice President Biden's 75th birthday, is giving a "free" bumper sticker that declares "I DIDN'T VOTE FOR TRUMP" as a reward. "Help us make Joe's last White House birthday extra sweet," reads the Democratic email solicitation. I SURVIVED OBAMA AND DODGED A BIGGER BULLET WITH HILLARY!!!! Nice montage but where is the one of Joe groping that state trooper. Joe’s hand on his leg and the priceless look on the troopers face. People need to grow up and not bee such pussies. It’s free speech. If people want to say they didn’t vote for him, its their right. We don’t have to immediately fall into the “Dear Leader” mentality that the other side always follows. But only because the “I wouldn’t cross the street to piss on Bidet if he were on fire” bumper stickers weren’t available. Yeah, but Uncle Creepy put it on upside down. Sorry about that. I see it’s in there. I fail to see the connection. Uncle Creepy wasn’t running so he’s out the door in a couple months no matter who won. This is has nothing to do with his birthday. As the headline reads, it’s nothing but rudeness. Picture at the top. 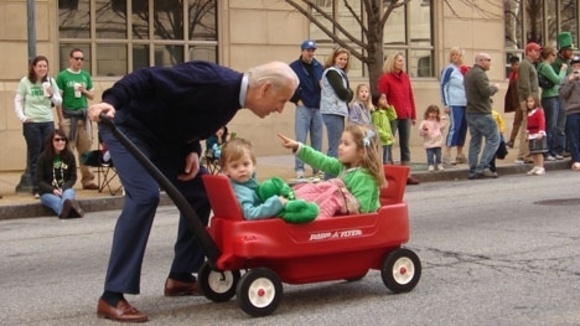 Does his VP van have "Free Candy" the side of it? Liberals always act like sullen 13 year olds when they lose. The W.C. Fields looking guy? It’s there, just small. Millions and millions of democrats didn’t vote for The Beast. But, I’ve read and heard that this was a ‘divisive’ election...and ‘hate crime is up’ after the election, with Trump supporters apparently turning into psychotic skinheads. The left is trying to frame the conversation, and put the right on defense (again, and it usually works). I don’t think its a bad thing to keep score, and note who is really being ‘divisive’, to fight this notion that Trump supporters kick immigrant babies like soccer balls for sport. Lots of shark jumping going on. Stretch that one out and I’d slap it on my 4x4 bumper.